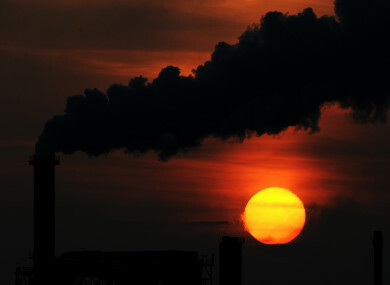 File photo of the sun setting behind a smoking chimney of an industrial plant in Wismar. THE CONCENTRATION OF carbon dioxide (CO2) in the atmosphere has hit a new high, the UN said today, warning that drastic action is needed to achieve targets set by the Paris climate agreement. “Concentrations of carbon dioxide in the atmosphere surged at a record-breaking speed in 2016 to the highest level in 800,000 years,” the World Meteorological Organization said. “Globally averaged concentrations of CO2 reached 403.3 parts per million in 2016, up from 400.00 ppm in 2015 because of a combination of human activities and a strong El Nino event,” it said. The Greenhouse Gas Bulletin, the UN weather agency’s annual flagship report, tracks the content of dangerous gasses in the atmosphere in the post-industrial era (since 1750). Researchers have “reliable, direct measurements” of C02 concentrations rates going back 800,000 years using air bubbles preserved in ice in places like Greenland and Antarctica, the head of WMO’s atmospheric environment research division, Oksana Tarasova, told reporters in Geneva. But by studying fossilised material the WMO also has rough estimates going back even further. Using those measures, the report found that the last time Earth experienced similar CO2 concentration rates to today was three to five million years ago, when the sea level was up to 20 metres (66 feet) higher than now and the planet was 2-3 degrees Celsius warmer. WMO chief Petteri Taalas told reporters that “there is hope” to reverse the worrying concentration rates but underscored that the time to act was now. “Without rapid cuts in CO2 and other greenhouse gas emissions, we will be heading for dangerous temperature increases by the end of this century, well above the target set by the Paris climate change agreement,” Taalas said in a statement. The historic agreement approved by 196 countries two years ago is facing renewed pressure following US President Donald Trump’s decision to quit the accord. “The numbers don’t lie. We are still emitting far too much and this needs to be reversed,” the head of UN Environment Erik Solheim said in a statement, reacting to the new report. Email “Carbon dioxide levels in the atmosphere have hit a record high”. Feedback on “Carbon dioxide levels in the atmosphere have hit a record high”.